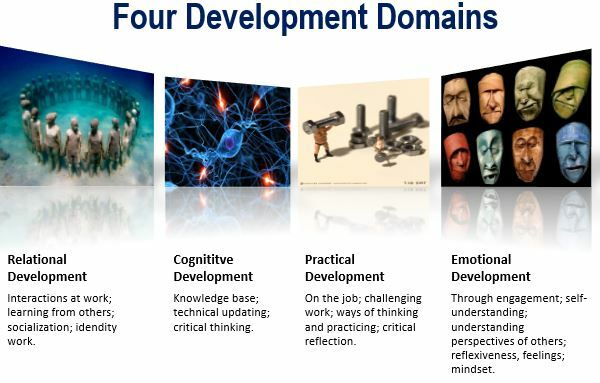 Learning and identity development can occur across four domains, namely: relational development; cognitive development; practical development; emotional development. Learning may involve development in one or more domains and development in each domain can be achieved in a number of different ways. Although these patterns can be found in all learners, how you learn is unique to you. Knowing about these dimensions and how they work for you can help you learn more readily, or get you going afresh if you're feeling stuck. Each is described below, together with some case examples drawn from our recent research. A major route forrelational developmentis learning through interactions at work, learning with and from others (in multiple contexts) and learning as participation in communities of practice (and communities of interest) while working with others. Socialisation at work, peer learning and identity work all contribute to individuals’ relational development. Many processes of relational development occur alongside other activities but more complex relationships requiring the use of influencing skills, engaging people for particular purposes, supporting the learning of others and exercising supervision, management or (team) leadership responsibilities may benefit from support through explicit education, training or development activities. A major work-related route forcognitive developmentinvolves learning through mastery of an appropriate knowledge base and any subsequent technical updating. This form of development makes use of learning by acquisition and highlights the importance of subject or disciplinary knowledge and/or craft and technical knowledge, and it will be concerned with developing particular cognitive abilities, such as critical thinking; evaluating; synthesising etc. Question: do you find that although the knowledge underpinning your practice is important, it can sometimes be hard to transfer that into your day to day work? Forpractical developmentthe major developmental route is often learning on the job, particularly learning through challenging work. Learning a practice is also about relationships, identity and cognitive development but there is value in drawing attention to this idea, even if conceptually it is a different order to the other forms of development highlighted in this representation of learning as a process of identity development. Practical development can encompass the importance of critical inquiry, innovation, new ideas, changing ways of working and (critical) reflection on practice. It may be facilitated by learning through experience, project work and/or by use of particular approaches to practice, such as planning and preparation, implementation (including problem-solving) and evaluation. The ultimate goal may be vocational mastery, with progressive inculcation into particular ways of thinking and practising, including acceptance of appropriate standards, ethics and values, and the development of particular skill sets and capabilities associated with developing expertise. Foremotional development, the major developmental routes are learning through engagement, reflexiveness that leads to greater self-understanding, and the development of particular personal qualities. Much emotional development may occur outside work, but the search for meaning in work, developing particular mind-sets, and mindfulness may be components of an individual’s emotional development. Particular avenues of development could include understanding the perspectives of others, respect for the views of others, empathy, anticipating the impact of your own words and actions, and a general reflexiveness, which includes exploring feelings. Identity development at work may also be influenced by changing ideas individuals have about their own well-being and changing definitions of career success (Brown & Bimrose 2014). Henrik from Denmark switched career, moving into caring and developed a new relationship with his work, which he found much more emotionally engaging. While studying for his skilled worker qualification, Henrik immersed himself in individual assignments of his own choice. In one assignment, he developed a ‘product’ to help improve a pupil’s ability to communicate, an ability which was being lost due to a rare disease. When Henrik talked about the assignment he was very engaged and showed insight into the syndrome. Because the assignment was closely related to his experience and practice, he saw meaning in undertaking it: 'It was as though there was a circle I could complete on my own.' He received a top grade for the assignment, and it is evident that positive learning experiences and the perception of entering into learning processes that are meaningful to his life and work situation are strong motivating factors in his engagement in further learning. Just as continuing with your own learning and development at work have become increasingly important, so has supporting the learning of others working with you. One way a practitioner might support the learning of an individual with the process of identity development in response to the changing world of work is by helping them reflect upon their career story, develop a sense of career direction and a commitment to their learning, professional development and career adaptability (Savickas 2011). Brown, A. & Bimrose, J. (2014). ‘Model of learning for career and labour market transitions’, Research in Comparative and International Education, vol. 9, no. 3, pp. 270-286. Savickas, M. (2011). Career counselling, American Psychological Association, Washington, DC. It was Erik Erikson's idea of the importance of a moratorium or free space, a place of stillness, a place to gather themselves (especially in adolesence) in order to experiment with identities. Sherry Turkle (2011) in 'Alone Together' highlights how people experiment with identities in virtual worlds, although there is a difference to online spaces where there is still a link with the physical world and our place in it. On-line behaviour can help people develop a wider repertoire of real-world possibilities or those may slip away because of time spent on-line. Csikszentmihalyi outlined by the idea of 'flow': fully immersed in an activity with focus and involvement, while Turkle highlights how on-line life offers continual connection, if you are lonely and/or we crave it (for the shot of dopamine it gives). Does being always digitally connected mean you are less connected in other respects? On-line activity may lead to conscious on-line performance. Erikson - time spent caring for children leads to 'basic trust'. Turkle - purpose-driven (and networked) individuals leading to detachment, and a decline of empathy. Interesting argument although given that she argues for 'opening up a conversation about technology, privacy and civil society is not romantically nostalgic, not Luddite in the least' (p. 264), when that was EXACTLY what the Luddites wanted. They were not against new technology per se, but rather that which did not consider the wider social consequences, including identities. Bimrose, J. & Brown, A. (2013). Navigating the labour market: transitioning styles of adults receiving career guidance. In Wuttke, Eveline & Seifried, Jürgen (eds.). Transitions in Vocational Education and Training. Stuttgart: Barbara Budrich Publishers. This chapter explores how individuals who participated in career guidance processes as adults navigated their subsequent career pathways over the subsequent four years. The labour market transitions of these adults were investigated through annual interviews over five years and the transitioning ‘styles’ (strategic, evaluative, aspirational and opportunist) they used as they approached, then dealt with, career transition and progression issues were examined. The ‘matching model’ of career transition is dominant in the policy rhetoric around skills supply and demand. It assumes that optimal job choices are made when individuals have an understanding of their individual traits (e.g. abilities, aptitudes, interests, etc. ); acquired knowledge of jobs and the labour market; and made an objective judgement about the best fit between these traits and factors. When individuals are in the ‘right’ jobs in this model, the jobs match their aptitudes and abilities. However, the value of the matching model (developed over a century ago) is increasingly questioned. Individuals do not always engage in technically ‘rational’ behaviours, often making decisions based on their own ‘pragmatic rationality’ (Hodkinson/Sparkes (1997), including responding to randomly occurring opportunities (Mitchell et al. 1999; Hambly 2007) in an ‘intuitive’ way (Harren (1979). Additionally, even if individuals wished to adopt a technically rational approach to career choice they are faced with the realities of the ‘opportunity structures’ available at specific times in particular places (Roberts, 2009). The constraints on career choice are particularly marked for socially disadvantaged groups facing significant social, psychological and economic barriers to their progress (Leong et al. 1998). Further, it assumes a degree of labour market stability, with jobs and sectors having predictable requirements, to which the objectively measured abilities of individuals can be matched. Whilst this view may have had some validity fifty years ago, it is no longer true – with volatility and fluidity being defining characteristics of global labour markets. This chapter is based on the findings of a five year longitudinal study of labour market transitions, which examined the effectiveness of career guidance, initially involving 50 individual cases. Characteristic patterns of behaviour associated with four distinct transitioning ‘styles’ (strategic, evaluative, aspirational and opportunist) were identified in how individuals approached, then dealt with, career transition and progression issues. The research highlights the range of goals, aspirations, achievements and identities that shape how adults interact with, and move through, labour markets. It emphasises the dynamic ways many adults engage with vocational learning and development pathways, sometimes with transformational shifts in perspective as their careers unfold, often involving up-skilling and/or re-skilling (Brown et al. 2010). How individuals navigate career pathways was explored, with concepts of transitioning styles used to investigate how individuals coped with stressful labour market transitions. The chapter concludes with a critique of the dominant career transition paradigm that currently underpins the practice of formal career support of individuals navigating their labour market transitions. Evaluative career decision making is reflected in the psychological literature on emotional intelligence, whereby individuals can possess a range of social and emotional competences. This approach exemplifies the notion that self-appraisal through the identification and evaluation of individual needs, values and abilities is central to career planning for some individuals (Ball 1996). Individuals using this decision making style are undertaking a process of learning about themselves and the consequences of their decisions. Through a process of self-reflection and evaluation, individuals become: more comfortable and confident in their decisions; aware of their particular skills; and are able to identify preferred outcomes and goals (Gati/Saka 2001). The career narratives of six of the 29 research participants in the final phase of the longitudinal study demonstrate strong elements of this approach to career decision making. They had engaged with a process of critical self-reflection and self-evaluation that comprised periods of (sometimes prolonged) review and reflection, where career decisions were often seen as provisional, although they could also potentially contribute to a longer term career goal. A degree of uncertainty and ambiguity about career plans and how to enact then was evident throughout, partly because there was always the possibility that the process of reflection might indicate the value of a change of direction and a different future. Interestingly review is often seen in positive terms (ensuring career plans are current), but if review occurs too frequently and/or does lead to changes of direction, the process could easily be construed negatively as prevarication or indecision. A strategic approach represents a more focused career decision making style, based on cognitive processing. Here, individuals base their choices on a process of analysing, synthesizing and weighing up advantages and disadvantages, then setting plans to achieve goals. Through this process, decisions are primarily based on rational considerations (Baron 2000). Individuals using this style of processing information and making decisions are competent in understanding a problem, considering and reflecting on options, and, perhaps more importantly, focusing on one particular solution (Sampson et al. 2004). This approach is essentially the same as the ‘rational’ style identified by Harren (1979) and was used by six . The term ‘strategic’ was used in an earlier relevant study of the development of engineers’ work-related identities which identified four forms of strategic action in which those in work may engage: identification; adjustment; strategic career; and redefinition (Brown 2004). Those individuals following a strategic career have initially committed to a particular occupation, and can be single-minded in achieving that initial goal even if a number of other steps are required. However, once the initial goal has been achieved, they are subsequently likely to continue to be interested in career progression, if avenues are available that build on their existing skill set in new ways. They are seeking to build their career strategically, enhancing their existing skill set, often following accepted progression pathways (for example, becoming a team leader, specialist, tutor, manager etc.). A small number of research participants (three out of the 29 in the fifth year of the research study) were pursuing interim career goals which seemed almost tangential to their ultimate career aspiration, yet for them either represented relevant preparation or were regarded as unavoidable. Aspirational careerists adopt a style of career decision making based on focused but distant career goals and their career decisions are inextricably intertwined with personal circumstances and priorities. The aspirations may be career or personal and relate to performing, self-employment or any ‘dream’. They will take jobs to ‘get by’ – that is, provide the necessary finance to keep the aspiration alive, work becomes a means for striving for a distant goal. Interim goals are sometimes, but not necessarily, related to formal employment and achieving their ultimate career goal is definitely a ‘work in progress’. The fourth style of career decision making identified describes those individuals who have taken opportunities that have presented themselves, however unexpected, and tried (sometimes successfully, sometimes unsuccessfully) to turn them to their advantage. This was the largest group in the research sample, with eight out of 29 illustrating this style in the final phase of data collection. Opportunist careerists have a very different approach to career decision-making compared to the other three styles explored above. They exploit available opportunities rather than make active choices about work (see, for example, Banks et al. 1992, for further examples of this approach). Participants’ career plans could seem vague, undecided and uncertain. This resonates with the concept of ‘planned happenstance’ that encourages us to be receptive to randomly occurring opportunities that could be critical in shaping our careers (Mitchell et al. 1999; Hambly 2007) and the need for practitioners to place greater importance on context. This type of decision making behaviour has certain similarities with Harren’s (1979) ‘intuitive’ decision making style. Findings from the longitudinal study challenge, fundamentally, the notion that a matching approach is generically suitable. For some (perhaps even a minority) – of those who use a strategic career decision-making approach – this paradigm is, indeed, entirely suitable. However, for others (possibly a majority) it is not. For policies designed to support the up-skilling and re-skilling of the labour force to be successfully implemented, these differences will need to be accommodated. Only a minority of adults make use of formal career guidance provision so a question may be raised about the generalizability of the findings to all adults. However, the point which is clearly generalizable is that there are a range of career decision-making styles other than the career decision-making approach around which much career guidance is still organised. Additionally, however, specifically to address this question, two follow-up studies are being conducted in Ireland and China. The longitudinal investigation of adult career trajectories has revealed a multiplicity of factors combining to produce complex patterns of movement. Effective careers guidance aims to support individuals at all stages of their career, to reflect on their skills, consider various options and embrace career change. It needs to ensure that it incorporates research findings, including those relating to career decision-making styles, which will enable it to enhance its effectiveness. A substantial evidence base now exists that indicates the positive impact of careers guidance on the working lives of adults. Reshaping careers, learning and identities is a daunting challenge for everyone and careers guidance can play a major role in helping adults construct new coherent career narratives, if it takes account of differences in career decision making styles, when considering how learning can help drive these processes. Ball, Ben (1996): Assessing Your Career: Time for Change? Leicester: British Psychological Society. Banks, Michael; Bates, Inge; Breakwell, Glynis; Bynner, John; Emler, Nicholas; Jamieson, Lynn; Roberts, Ken (1992): Careers and Identities. Buckingham: Open University Press. Baron, Jonathan (2000): Thinking and Deciding. Cambridge: Cambridge University Press. Brown, Alan; Bimrose, Jenny; Barnes, Sally-Anne; Kirpal, Simone; Grønning, Terje; Dæhlen Marianne (2010): Changing Patterns of Working, Learning and Career Development across Europe, Coventry: Warwick Institute for Employment Research. Brown, Alan. (2004): Engineering identities. In: Career Development International, 9, 3, pp. 245-273. Gati, Itamar & Saka, Noa (2001): High School Students’ Career-related Decision-making Difficulties. In: Journal of Counselling and Development 79, 3, pp. 331-340. Hambly, Liane (2007): New theory: Implications for Guidance Practice. In: Career Guidance Today 15, 3, pp. 30-33. Harren, Vincent (1979): A Model of Career Decision Making for College Students. Journal of Vocational Behavior 14, 2, pp. 119-133. Hodkinson, Phil & Sparkes, Andrew (1997): Careership: a Sociological Theory of Career Decision Making. In: British Journal of Sociology of Education 18, 1, pp. 29-44. Leong, Frederick; Austin, James; Sekaran, Uma; Komarraju, Meera (1998): An Evaluation of the Cross-Cultural Validity of Holland’s Theory: Career Choices by Workers in India. In: Journal of Vocational Behavior, 52, 4, pp. 441-455. Mitchell, Kathleen; Levin, Al; Krumboltz, John (1999). Planned Happenstance: Constructing Unexpected Career Opportunities. In: Journal of Counseling and Development 77, 2, pp. 115-124. Roberts, Ken (2009) Opportunity Structures Then and Now. In: Journal of Education and Work 22, 5, pp. 355 – 368. Sampson, James/ Reardon, Robert/Peterson, Gary/Lenz, Janet (2004): Career Counseling and Services: A Cognitive Information Processing Approach. Belmont, CA: Brooks/Cole. The current focus of UK skills policy is on four policy areas (economic performance; skills demand; skills supply; and jobs and skills mismatch), based around concerns with organisational productivity, sectoral and regional policy, education and training, the labour market, and reducing inequality and promoting social mobility, while addressing three key underlying issues: individual aspiration; employer demand; and responsive provision (UKCES (2010) Ambition 2020: World Class Skills and Jobs for the UK). What is missing from this set of concerns, however, is any sense of progression of individuals through work across the life-course, particularly insofar as this involves moving between sectors. As a consequence, a dynamic element of how individuals become engaged with learning and development pathways, which involve upskilling, reskilling and sometimes transformational shifts in perspective as their careers develop, is largely absent from current policy analysis. The GLACIER group at IER believe this gap could be filled with a focus on ‘career adaptability.’ Our current research in this area builds upon a major ten country enquiry into changing patterns of career development across Europe, which highlighted how some people were much more successful than others in negotiating a series of work-related transitions. Additionally, it extends international research from a seventeen country study into the concept of career adaptability, which we believe to be a key element in understanding successful transitions and accumulation of skills at the individual level. The concept of career adaptability is strategically important because whilst ‘employability’ seeks to ensure that individuals can find a place in the labour market, ‘career adaptability’ is concerned with the development of, and support for, the capability of an individual to make a series of successful transitions where the labour market, organisation of work and underlying occupational and organisational knowledge bases may all be subject to considerable change. The aim of this study is to assess and develop existing (national and international) knowledge about career adaptability, with particular emphasis on skills accumulation, in order to provide a platform for the development and support of career adaptability in a UK context. The objectives include exploring the potential of the concept of career adaptability to empower individuals to take positive decisions and actions regarding their skills development; and investigating the influence of particular labour market conditions in supporting career adaptability (through an Anglo-Norwegian comparison). Using career adaptability as an analytical framework, helps address the issue of readiness of young people for different types of employment: ‘adaptability’ provides real purchase on this issue precisely because it can be examined in terms of individual proactivity, relational issues and quality, structure and nature of institutional support (examples from engineering, accountancy and healthcare show how career adaptability can be fostered and developed as a process extending right through to ‘experienced worker’ status and how the lack of challenge and support in work can undermine earlier preparations prior to employment). It can also help highlight the value placed on different types of knowledge, skills, qualifications, experience in their learning and skill development. We will be looking, in particular, to make a qualitative comparison of successful transitions in the UK and Norway. Norway is an interesting comparator because it has a buoyant labour market and low unemployment and would help us answer the question relating to the extent to which career adaptability takes different forms in different structural contexts – career adaptability is likely to be influenced by the dynamic interaction of structural and agentic factors. Separately, a detailed conceptualization of career adaptability is being be derived from an ongoing seventeen country study in which IER is participating. Whilst career adaptability is derived from a psychological perspective, it is also influenced by psycho-social factors (through the interaction with others) and structural factors (such as the provision of careers guidance and other forms of support in making transitions). The proposed research will therefore enable a deeper understanding of the potential role of career adaptability in employment and skills policies derived from a range of contrasting international contexts. My broad argument is that doing something well in terms of cognitive development, the affective domain or development of psycho-motor skills can be used as a basis for development in other areas too. Here I want to say something about the development of interpersonal skills in relation to higher skills development more generally. A 'Listening and Interpersonal Skills Review' was produced in 2007 by Therese Shepherd, Julia Braham and Carol Elston of the University of Leeds. Their paper offers the non-subject specialist an overview of the literature which has influenced the development of listening and interpersonal skills in UK higher education. It refers to articles, seminal texts and writers within the field. The importance of these skills within occupational and educational domains is also highlighted. See: http://www.learnhigher.ac.uk/Download-document/293-Literature-Review-Listening-and-Interpersonal-Skills-19-06-07_1.htm. However, transfer of knowledge between education and work in professional contexts is problematic, because of the challenge of combining the various relevant aspects of knowledge and skill into an integrated, holistic, performance (Michael Eraut has written about this - see, for example, http://www.mofet.macam.ac.il/iun-archive/mechkar/pdf/TransferofKnowledge.pdfor http://www.ou.nl/Docs/Expertise/OTEC/Publicaties/els%20boshuizen/deel3.pdfor http://learningtobeprofessional.pbworks.com/f/CHAPTER+A2+MICHAEL+ERAUT.pdf). Yes I wanted to say something we’ve picked up on the information, advice and guidance front. An issue I think is important following on from that point about information, is actually just to look at where people go in terms of the careers after following certain paths and the information associated with that. I think it ties back to the point about languages and also to a certain extent the challenges associated with maths. I mean one of the disadvantages of the modular and credit systems is to a certain extent you can do things which duck away from certain areas which are actually quite demanding, like languages and subjects which have a mathematical underpinning. They have really serious labour market consequences and the premiums if you do these sorts of things well are astonishing. Now you come into a different area because when you give people this type of information: you come up with things like if you get a Degree in a non numerate subject which is a 2:2 or below, you know in the following 5 years after graduation your prospects are greater than somebody who got a first or a 2:1 in a non numerate subject. Absolutely stunning in terms of the difference. Now there might be other reasons why you want to do different sort of things, but there is opposition to that type of information being given at the school level. In an English context you have the case where, again, it is better to take difficult subjects like languages and maths and do less well, but you try telling that to head teachers in England, you know they go crazy. I thought I was going to be beaten up once when I said that, because they concerned with school performance tables. But they’re the sorts of things where the information comes and then the point about the guidance, you’re absolutely right, the guidance comes later. I think you are also right to focus on the client, addressing people not about where they fit in terms of a qualification or where they fit in terms of giving them a course, but where they fit as an individual. It is interesting in that sense that the French system, bilan de competence, gave them a right to a number of days where they reassessed their career as an individual with a guidance practitioner. So I do think that’s right, but I do think there are also things we can do on the information side and to address this confidence issue. It is also linked to the point about value of learning languages and seeing things from a different perspective and I think that one of the things is that although the confidence issue can be partly addressed by the need to do something well, which is where I started when I was talking about some of the different sort of settings in which to perform well and what effects that had in terms of confidence and self esteem. I think that developments in the cognitive dimension can be linked with other forms of development: you can be good with people, understand their feelings, get a sense of place, as affective and psycho-motor skills can be developed too. The example I always give, which again is from another TLRP project in which was involved, looked at teaching and learning in special areas like music and sport. It had a number of researchers in Scotland and England and one of the students in the project was at The Royal College of Music. She was a singer and she performed and made a presentation at an event where the young people themselves talked about the research and performed and it was very instructive in terms of what she did. She performed as a singer and it was stunning, but in her reflections on the research she also recognised that her skill set in terms of what made her a really good singer (although she also recognised she wasn't going to make a career in terms of singing) also led to a degree of self-reflexiveness. She was able to say what I am aware of is my body in terms of what I have to do in order to produce this sort of performance and have to reflect upon and so on and so forth and from that she said ‘I think I’d make a pretty good psychotherapist’ and you thought yeah I bet you would. There was that sense of the confidence from doing something well that spills over into other areas and it is that sense of allowing people to excel in other areas other than just the cognitive which is important.